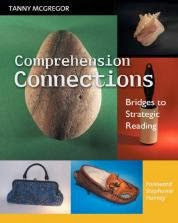 One of my favorite books ever for teaching comprehension strategies in reading is Comprehension Connections by Tanny McGregor. She has some wonderful lessons that allow students to use the comprehension strategies in real life and really set the stage for using them while reading! Each strategy has an anchor lesson to start with that you can use it to create a really concrete experience for your students. It really makes the connection to reading so much easier for some kids. In addition to these anchor lessons, Tanny goes on to provide ideas for lessons using art, music and wordless book- all to get your students ready to use these comprehension strategies in reading! I don't always have time each year for each lesson before jumping into the strategy use in reading, but I almost always use this lesson when teaching inferring. I start with collecting a strategic bag of trash from around my house a few days before I plan to do the lesson. Keep in mind that you have to have an idea of the "family" that this trash is going to belong too, so your trash, or evidence, is going to have to match that family. You can see from my chart that I collected trash that I knew would help my students to hopefully infer that this family consisted of a mom, dad, and baby. So, I had things like store reciepts, old magazines, baby wipes containers, diapers, certain old food containers, etc. The day of my lesson, I bring in the bag of trash and tell my students that I have a new neighbor. I explain to them that I know they moved in because I've seen their cars and saw the moving van, but I never really seem to see them out and about- I've even tried stopping by their house, but they're never home. I tell them that I really wanted to find out more about them, so I stole their trash hoping it will give me some clues about who lives there. At this point, the kids are usually looking at me like I'm crazy, but they (usually) completely go with it. (I often wonder how many of them go home that afternoon and tell their parents that I was digging in my neighbor's garbage!) I tell them that I really need their help using my neighbors garbage as clues to figure out who more about the family. 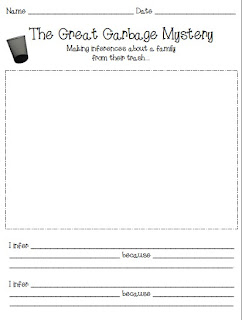 Then, I take out one piece of trash (my evidence) at a time and my students tell me what they think that this can tell me about the family (their inference). I chart this as we go and at the end of the lesson we sum it all up and figure out what all this evidence tells us about the family that lives next door. They then go back to their seat and draw a picture of the family that lives there on their recording sheet and tell me about 2 inferences they made based on the evidence. Let me tell you- this really sticks with my students! I can't take credit for this cute heading or recording sheet- the idea comes from Simply Sweet Teaching. Although I've done this lesson in the past, I've never used any kind of recording sheet and I really loved using it with my class this year. It really helped me gauge who "got it" and who didn't get it so much right away and i was able to hone in on working with those students. Beth & Karen no longer have the recording sheet up in their TpT store, but I remade it and you grab it here (for free) if you'd like to use it in your classroom. How do you teach inferring in your class? Love this lesson! Thank you!